A horse is a horse, of course, of course. Unless of course that horse is Great Britain’s first animal ambulance! Chase, a seven-year-old horse owned by Mark Bennett, has become the first medical horse to join the West Midlands Ambulance Service Community as a first responder thanks to his new job ferrying medical personnel like Bennett across the remote Cannock Chase Country park, an isolated park in Staffordshire. 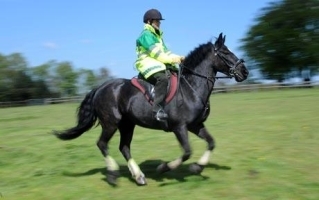 The scheme might sound crazy, but a horse can go where an ambulance cannot, in terrain a modern vehicle can’t handle. Chase carries a full array of medical equipment in his saddlebags, including splints, bandages, blankets, oxygen and breathing equipment, and even a defibrillator! Chase is getting a month-long trial run, but I don’t see how this could possibly be a bad idea. Certainly, Chase is better equipped at getting around than an ATV might be, and his feed is a lot less than gasoline!